The St Nicholas represented in this panel is Nicholas of Tolentino, an Augustine hermit who devoted his life to teaching and good works. 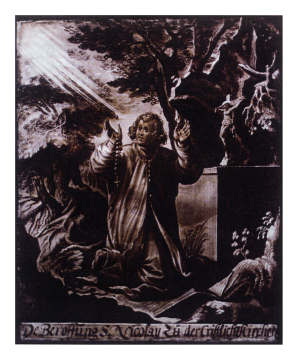 Here he is shown kneeling in a dark forest, with arms raised, looking up to his right where rays of light stream towards him. This is probably a reference to the star or comet said to have been seen at his birth, c. 1246. A rosary and cross hang from his right hand and on the ground before him lies an open book. To his left is a box on which stands a crucifix as if on an altar. He wears the long robes of the Augustinian order. Under the panel is the inscription: De Beroffüng S. Nicolay zü der Cristliche Kirchen. The dark shades of brown paint, relieved only by occasional highlights scratched in the paint is typical of German work of this date; for another example of this style see SG73 Scene from the life of saint Judasius. Although no Netherlandish source has been found for this representation of Saint Nicholas, the composition has strong Netherlandish influence, particularly in the integration of the main figure into the elaborate background.